Targeted toward the Harley Platform! 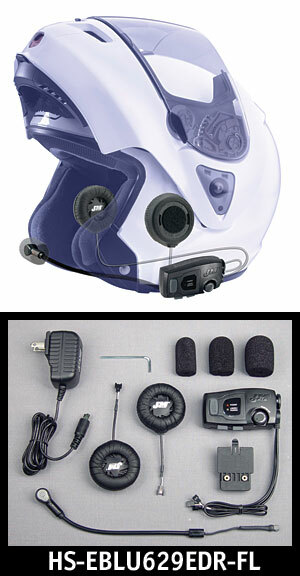 BM-SPH10HFM: Bluetooth headset & intercom designed for half helmets. 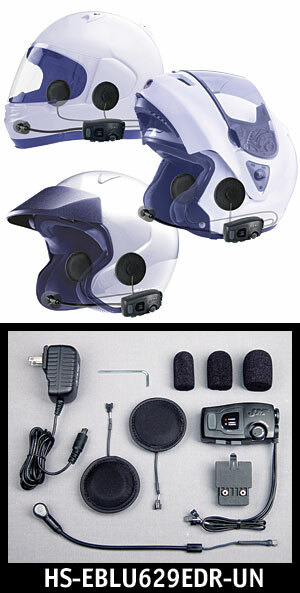 By simply attaching to your half helmet, you can call handsfree on your Bluetooth mobile phone and listen to stereo music by Bluetooth wirelessly, and have intercom conversations in full duplex with other users. Thanks to the latest Bluetooth 3.0 and the advanced digital signal processing technology, it offers the best sound quality for both incoming and outgoing sound in its class. 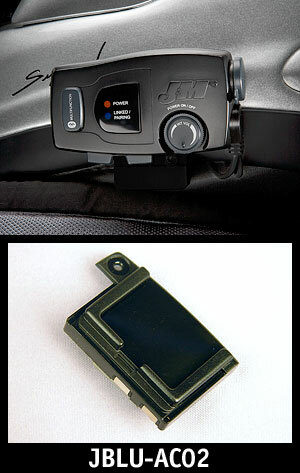 Also, the easy-to-access and intuitive button operations make this unit a perfect companion for motorcycle riders. 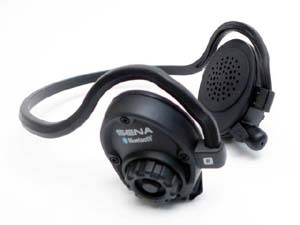 BM-SMH5: Bluetooth 3.0 stereo headset with Bluetooth intercom and built-in FM tuner designed specifically for motorcycles. You can call handsfree on your Bluetooth mobile phone, listen to stereo music or voice instructions of GPS navigations by Bluetooth wirelessly, and have two-way intercom conversations in full duplex with a passenger or other motorcycle riders. Thanks to the latest Bluetooth 3.0 and the advanced digital signal processing technology, these kits offers the best sound quality for both incoming and outgoing sound in its class. Also, the easy-to-access and intuitive button operations make these kits a perfect companion for motorcycles. 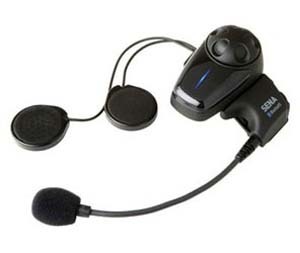 BM-SPH10: A Bluetooth v2.1+EDR Class 1 Stereo Headset with long-range Bluetooth Intercom designed specifically for motorcycles. With the BM-SPH10, you can call hands-free on your Bluetooth mobile phone, listen to stereo music or voice instructions of motorcycle GPS navigations by Bluetooth wirelessly, and have intercom conversations in full duplex with your companions. Thanks to the latest Bluetooth v2.1+EDR and the advanced digital processing technology, the BM-SPH10 offers the best sound quality in its class. The easy-to-access and intuitive button operations make the BM-SPH10 a perfect companion for touring. 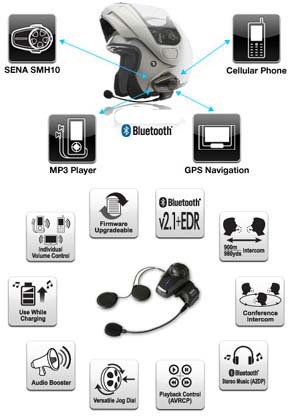 BM-SMH10: A Bluetooth v2.1+EDR Class 1 Stereo Headset with long-range Bluetooth Intercom designed specifically for motorcycles. With the BM-SMH10, you can call hands-free on your Bluetooth mobile phone, listen to stereo music or voice instructions of motorcycle GPS navigations by Bluetooth wirelessly, and have intercom conversations in full duplex with a passenger or other motorcycle riders. Thanks to the latest Bluetooth v2.1+EDR and the advanced digital processing technology, the BM-SMH10 offers the best sound quality for both incoming and outgoing sound in its class. Also, the easy-to-access and intuitive button operations make the BM-SMH10 a perfect companion for motorcycles. BM-SM10: The SM10 is a Bluetooth stereo audio adapter based on Bluetooth 2.1+EDR technology. You can connect various audio devices such as mobile phone or MP3 player by using the SM10. 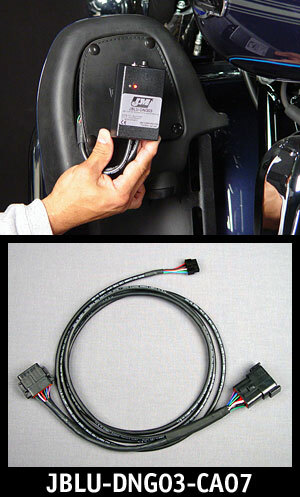 It also supports H-D onboard audio systems by using optional BM-A0120 audio cable. Along with the dual streaming feature of SM10, both you and your passenger may listen to the same music or radio at the same time by using Bluetooth headsets in the market. 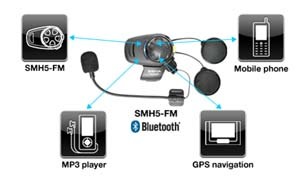 The SM10 has AUX audio input that enables you to connect additional non-Bluetooth audio devices such as radar/laser detector or motorcycle GPS navigation. BM-A0120: 3.5mm Stereo Jack to 7 pin DIN Cable for Harley-Davidson® Ultra Classic® Dimension: 230 mm x 100 mm x 20 mm (9.06 in x 3.94 in x 0.79 in) Weight: 33 g (0.08 lb). 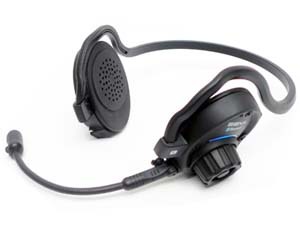 Bluetooth Helmet Headsets: The #HS-EBLU629EDR-UN is our elite series full-fidelity stereo Bluetooth wireless helmet headset, designed for installation into most open-face, flip-front and full-face style helmets. 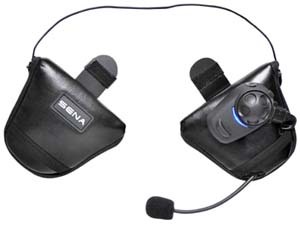 This headset also provides the industry’s best combination of wind and ambient noise reduction with the AeroMike® V miniature boom microphone. Bluetooth control head unit features the CSR BluecoreV enhanced data rate (EDR) Bluetooth module, for easy pairing to most Bluetooth enabled audio devices available. The J&M proprietary software package including the standard Bluetooth profiles of HSP, (Headset Profile) HFP, (Hands Free Profile), A2DP (Advanced Audio Distribution Profile), AVRCP (Audio/Video Remote Control Profile) along with the J&M Exclusive JMAHP (J&M Motorcycle Audio Headset Profile) & JMDPI (J&M Driver/Passenger Intercom Profile) is the most advanced Bluetooth software stack/package available anywhere. 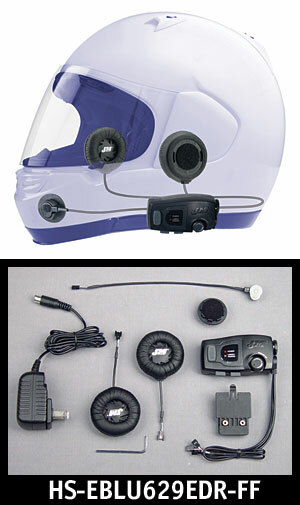 Note: J&M’s Bluetooth helmet-to-helmet intercom software profile (JMDPI) was designed for wireless driver/passenger (same motorcycle) communications, and while it can be used for bike-to-bike communications, the long-range performance cannot be guaranteed. Control head is powered by a rechargeable Lithium Ion/Polymer power cell providing 9-13 hours of use from a full charge (12-16 hours with the optional fat battery). 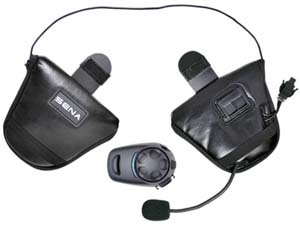 This headset kit includes all necessary mounting hardware, 110/220v charger adapter/transformer and complete installation/operation instructions. The audio performance of J&M’s Bluetooth headsets will rival that of our best corded headsets, so you don’t have to sacrifice good sound when going wireless. Our proprietary software package including the standard Bluetooth profiles of HSP, (Headset Profile) HFP, (Hands Free Profile) and A2DP (Advanced Audio Distribution Profile) along with the J&M Exclusive JMAHP (J&M Motorcycle Audio Headset Profile) is the most advanced Bluetooth software package available anywhere. The J&M brand are the only Bluetooth helmet headsets that are software upgradeable after the sale and free software upgrades are provided for the life of the headset warranty. J&M’s version .08 software package has just been released and is designed to better function with the latest multimedia devices like the Apple® I-phone, Google® G-phone and Garmin® Zumo660, along with the J&M custom dongles to allow you to configure a system to suit your riding style. 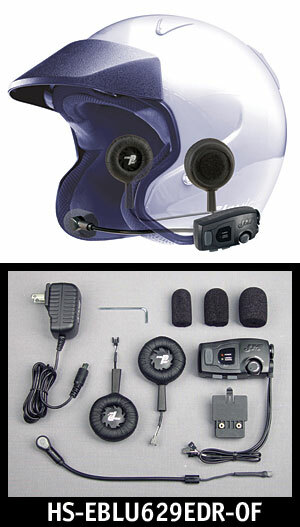 By early 2010 a proprietary, wireless helmet-to-helmet intercom software profile will be added to our existing software package and of course will be fully upgradeable to all previous and current J&M Bluetooth headsets. Superior audio performance, software versatility and dependability, backed by the best warranty and customer service in the business, it is easy to see why the obvious choice is J&M. 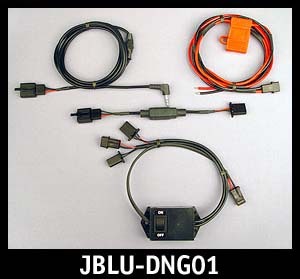 JBLU-DNG03-CA07: This harness cable assembly is designed to integrate the J&M custom dongle JBLU-DNG03, to the driver headset position, for the stock audio system on the 1998 and later Harley Ultra Classic. Dongle is placed inside the left front lower fairing storage pocket when in use and linked to a J&M Bluetooth helmet headset (only). 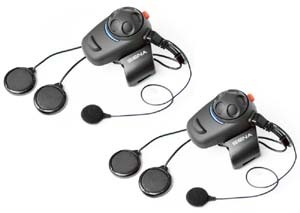 The J&M Bluetooth headset/dongle combination when used in this configuration will provide all of the standard functions of a normal corded headset as used on the Harley Ultra audio system, but without the cord, including stereo music to the driver’s headset, driver/passenger intercom, CB radio etc. 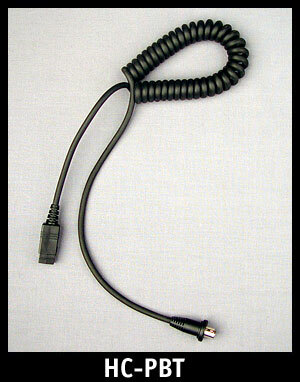 The stock Harley corded headset connector can still be used, when the dongle is not plugged into this cable harness. 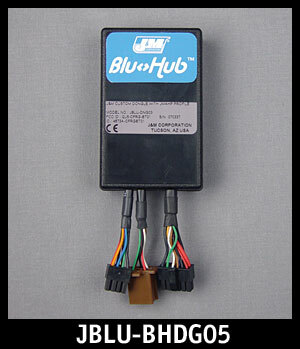 JBLU-BHDG05: This is a J&M custom Blu Hub module featuring the exclusive JMAHP (J&M Motorcycle Audio Headset Profile) Bluetooth® software profile, transmitting true stereo to 1 or 2 J&M Bluetooth headsets, with simultaneous microphone signals transmitted back down to the dongle. When 2 J&M Bluetooth headsets are linked to the dongle05, the continuous helmet-to-helmet intercom feature is activated thru the dongle. 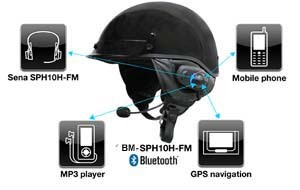 Rider and passenger can also each simultaneously link their J&M Bluetooth helmet headsets to their own cell phone or Garmin Zumo, while linked to the dongle05. 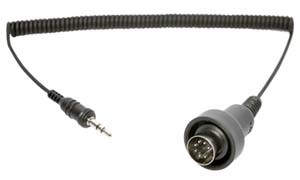 This dongle05 is used to create a full featured motorcycle audio system, with stereo music, CB/FRS, Navigation commands, cell phone etc available depending upon the capabilities of the external equipment being connected. The J&M Dongle05 is powered by the electrical system on the motorcycle (no batteries in the dongle to charge). 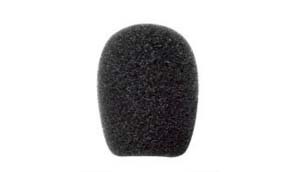 JBLU-DNG02: This small, compact and easy to use A2DP Bluetooth stereo dongle will connect to most any stereo source, via the standard 3.5mm 3-con stereo jack, to link and provide 2 channel stereo to J&M’s Bluetooth helmet headsets. 110v wall charger included. JBLU-DNG01: Custom-built J&M Bluetooth® Dongle that will plug into your favorite I-Pod, satellite radio receiver or other personal music device, via the standard 3.5mm 3-pin plug, to transmit two-channel stereo to your Bluetooth helmet headset. 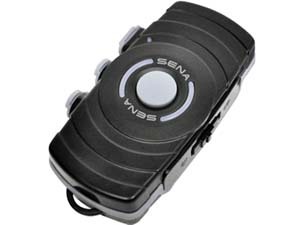 Unit also features a port to connect to selected radar detectors, using one of the optional J&M radar detector harness adapters, so that the beeps/brapps from the radar detector will be heard over the music, while in addition providing the power/ground connections for the radar detector. This unit links via Bluetooth software profile A2DP (Advanced Audio Distribution Profile ((streaming stereo)). Unit is motorcycle powered with 12v power and ground connections into your motorcycle’s electrical system (no batteries to charge). Kit includes dongle module, optional plug-in ground loop isolator, 3.5mm 3-conductor music input plug and a complete installation/operation manual. HC-PBTZ: This new P-Series 8-pin lower-section hook-up cord can be used with all J&M headset series #’s HS-BCD279, HS-ICD279- HS-ICD284, HS-BCD277, HS-ICD277, HS-BCD257, HS-BCD174, HS-ICD174 and #HS-CD9174 series helmet headsets, for connection to the rear jack on the J&M #HS-BLU277 series Bluetooth clamp-on helmet headsets, for seamless and simultaneous driver/passenger communications. JBLU-AC02: 1,050 MAH Lithium Ion “fat” battery upgrade for all HS-BLU277 series clamp-on helmet headsets, providing 14-18 hours of operation per charge. 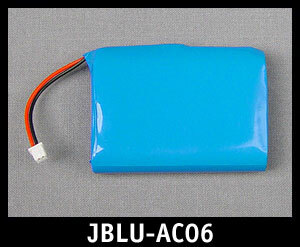 JBLU-AC06: Replacement 1,700 mah Lithium/Ion/Polymer power-cell for Bluetooth headset parts HS-BLU277EDRI-N103, HS-BLU277EDRI-N102 and Bluetooth Dongle part JBLU-DNG03. With the nature of Bluetooth® products and the confusion surrounding how they actually work in the motorcycle riding environment, please review the following points prior to your purchase, as all J&M Bluetooth sales are final. J&M Bluetooth helmet headsets are the best performing Bluetooth headsets on the market today, providing sound and fidelity in the helmet, equal to our best performing corded headsets. 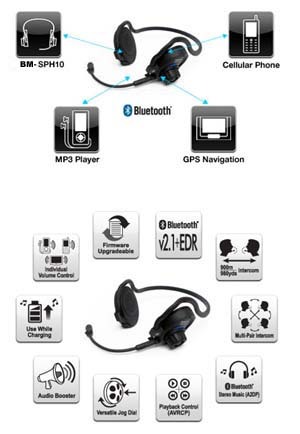 J&M Bluetooth headsets use only the latest Bluetooth software profiles to allow proper linking to the latest Bluetooth enabled cell phones, MP/3 music devices, GPS units etc, along with J&M’s custom dongles. J&M Bluetooth headsets must be fully charged each time before use, and if the battery goes dead during your day while riding, you will need to stop and re-charge it. Lithium Ion batteries are relatively expensive and will need to be replaced every 1 ½ - 3 years for proper operation of the headset or dongle, and these batteries are NOT covered by J&M’s 2-year limited warranty. Some Bluetooth enabled devices may not work together consistently, and/or all of the listed features may not be available/compatible with other Bluetooth devices and Bluetooth headsets. Bluetooth enabled devices can sometimes unlink from each other for reasons that cannot be readily explained, and then need to be re-linked again for proper operation, causing frustration and inconvenience for the user. 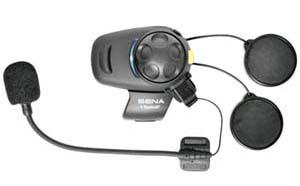 When using one of J&M’s custom dongles operating in the JMAHP Bluetooth profile, connected to a motorcycle audio system with the driver/passenger intercom feature, there is an approximate 90ms delay in the talkback function into the helmet. 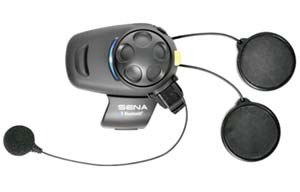 This delay is not bothersome to most users, but some may object to it compared to the operation and sound of the intercom system when using corded headsets. In the end you should consider whether or not the higher costs of the Bluetooth headset and/or custom dongles (up to three times higher than the equivalent corded headset solution) along with the sometimes complicated linking/use scenarios, are worth it for your particular riding situation, just to take the place of the simple to use headset cord. We you to be happy with your purchases, so please keep in mind the above considerations BEFORE purchasing any of our Bluetooth products.